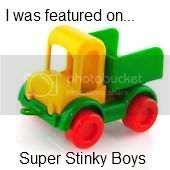 Go ahead and ask me where I got this idea and I would have to tell you it was not my idea. I had not much to do with this project at all. I was only allowed to provide materials upon demand. This is the brainchild and creation of my five year old daughter. Totally created by and thought up by my beautiful and smart little cookie! Yep she has the project bug as well. It has been past down for four generations for sure. My mother and my grandmother were both HUGE into crafts and sewing. 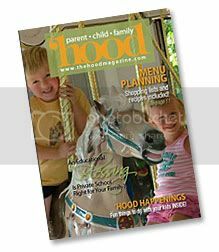 So as my first ever guest blogger I would like to invite my darling daughter to the computer to tell you how she created this project. I wanted to make a project and my mom said yes. I told her I needed six paper plates and crayons. I traced my hand and my little brothers hand and my baby brother's hand and made them into turkeys. My mom taught me how to do that last year so I already knew how. My brother who is 3 years old colored his own hand. I taught him what to do. My baby brother tried to color his hand after I traced it for him but he needed me to help him finish his, he is only one. I wanted a turkey on each side of the plate, so I colored 12 turkeys. It was a lot of work for me but I really wanted to do it. 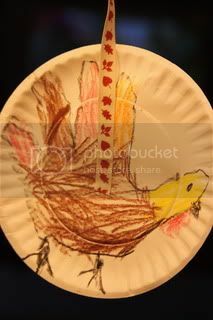 The hardest part was when I traced the turkey on the back of one plate it was almost upside down from the one on the other side. 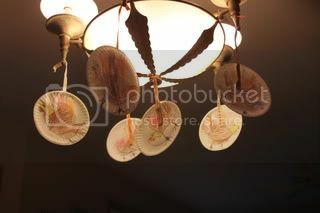 This made me a bit mad, but my mom showed me if I turned the plate sideways it just looked like they were flying crooked like Turkeys fly. Turkeys are big so they don't fly so well. 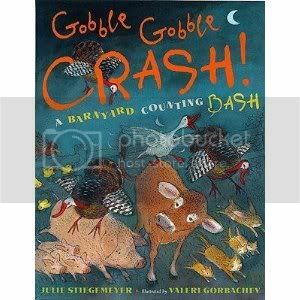 I even have a book called Gobble Gobble Crash that talks about it. When I was done coloring the Turkeys I told my mom I needed tape and ribbon. Mom still didn't know what I was going to do and I would not tell her. She said she had some fall ribbon so I used that. I taped the ribbon to the plate. Then I tied the ribbon to the ends of the light. Mom had to help me tie the middle one, but the rest I did myself. I think you should do this project because it is fun. 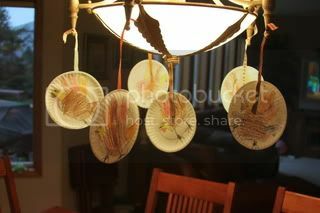 Mom said she liked my idea because on Thanksgiving you put turkey on plates to eat them. I thought that was kind of funny to think about. Get it hand turkey on a plate and real turkey on a plate. "giggles"
If you like to draw and you have plates this is a good project for you. Thank you for letting me share this project with you. I hope you like it. Cuuuuuuuuuuuuuuuuuuuuuute! 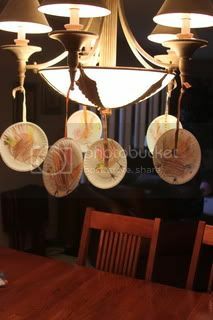 My kids would love to do this fun project I'd love for you to link up your tiny tot turkey mobile on my blog for Fun Stuff Fridays.